Drain flies, which have a fuzzy appearance, can take up residence in your kitchen and bathroom sinks (and also your bathroom walls), feeding on organic matter and sewage in your pipes. While drain flies do not transmit diseases, they may grow in numbers if not stopped. The number one tip to control drain flies is to perform regular drain cleaning once per month to prevent clogs (and thus eliminate the ideal breeding area for drain flies). Professional drain cleaning services are ideal, not only for the sake of preventing drain flies but also for preventing expensive repairs. If you are noticing drain flies, there is likely a clog in your sink. Most experts would recommend professional drain cleaning services in this case, but below you will also find the DIY method. The purpose of this step is to remove any potential areas where the flies could have laid their eggs. Remove the hair catcher and clean it well. The next step is to clean the pipes with a metal pipe brush. Push the brush as far down as possible and then twist it as you bring the brush slowly back out of the drain. Ensure that you use a plumbing snake with caution. If you have never used a plumbing snake before and do not feel comfortable, it is better to skip this step. However, if you do proceed, insert it into the pipes and then twist it to remove any lasting grime in the pipes. The next step is to pour 4 oz of gel drain cleaner around the edges of the drain. 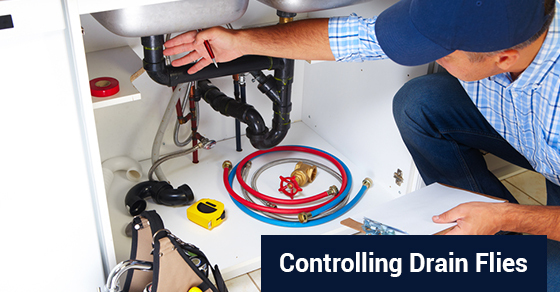 Allow the drain cleaner to sit there for a few hours before attempting the next step. You may need to repeat this step once a day for up to a week. The final step is to flush the sink with water and then take a plunger and remove any last bit of grime. Adult flies will continue to live for about 20 days, but since they have nowhere to lay their eggs, the problem will dissipate after they die. Spray an insect growth regulator inside the drain and along the drain lines. This stops the eggs from developing beyond larvae. Drain flies are just another reason why routine drain cleaning is important. If you are in need of drain cleaning services, contact our team of experts at Brothers Plumbing today. We have over 50 years in the industry and offer affordable rates.